Lateral ankle sprains (LAS) are one of the most common sports injuries, especially in indoor/outdoor court sports such as Basketball, Netball and Tennis (Fong et al., 2007). As a result they have a high economic burden with direct and indirect costs associated with the injury. Some researchers claim that the burden of LAS in the US alone during the 90s/2000s was in excessive of US$2 billion per year (Dallinga et al., 2012). The concerning thing is that this figure may be under appreciated as it has been found in the literature that less than half of all people who experience a LAS will actually seek medical attention (McKay et al., 2001). 2) Most people prematurely return to sport; when their pain is absent. 1) Exercise Therapy: Exercise therapy when performed in high doses (>900mins) significantly reduced the chances of recurrent LAS by 42%. Furthermore, exercise therapy significantly improved function following primary LAS. 2) Bracing/Taping: Significantly reduced the risk of recurrent LAS by 62%. It is currently recommended that a brace be worn on the injured ankle, or that it is taped for every game or training session for at least 6 months following the initial LAS. 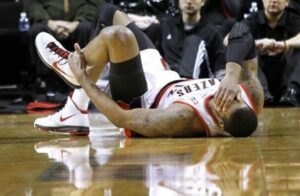 1) Ankle sprains are not so simple, and they need to be respected. 2) The absence of pain does not mean that you’re ready to return to sport. The subtle losses of strength, ROM, proprioception and balance do not magically re-appear once your pain has gone. 3) Make sure you see a physical therapist and COMPLETE your rehab; 6 weeks of regular strength, balance, stretching, plyometrics and agility should be considered a non-negotiable part of the rehab plan. 4) Ensure that you brace or tape your ankle for training and games for at least 6 months following your sprain. 5) Like every injury, the decision to return to sport following a LAS should be based on performance criteria such as strength, balance and hop tests rather than time-alone or the absence of pain.